We loved working with the Graphic Design students at University of Tampa on their final packaging project on recycled materials! The final project was printed on recycled chipboard on our wide format press. 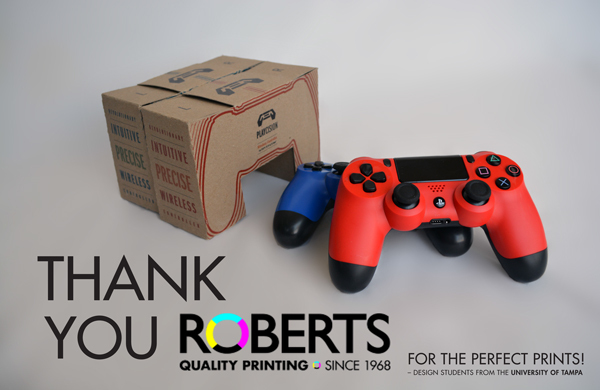 At Roberts Printing our customers always come first. Click here to contact us. Roberts Printing has been proudly serving the Tampa Bay Florida area for over 50 years. We have provided quality printing to our customers and continue to deliver the best technology in offset and digital printing, direct mail, as well as online storefronts that offer 24/7 ordering access to all of your marketing materials. Tampa Bay Commercial Printers – Printing in Clearwater, Tampa, Largo, St Petersburg, Dunedin, Palm Harbor, Oldsmar, Tarpon Springs, FL, Florida, Digital Printing, Large Format Printing, Direct Mail, Signs, Banners, Mailing, Web Design, Brochures, Catalogs, and much more!